The Snapper Lawn Mower company traces its roots to 1951, when the first rotary mower bearing the name “Snappin’ Turtle” rolled off he assembly Line in East Point, Georgia. Featuring self propel and rotary blade design which has since become standard, the country was taken by storm. The company eventually changed the name to Snapper lawn mower company, and supplied many of the innovations that led the lawn mower industry for decades. The company was acquired by Briggs and Stratton, and continues to manufacture an excellent line of mowers. All the models are equipped with heavy duty steel decks. Some have steel wheels fitted with ball bearings. Snapper lawn mowers may feature a unique rear wheel self propel design, which eliminates gears altogether. This system uses a rotating disc which is incredibly durable, and allows for speed adjustment. Most models are of the ‘3 in 1’ design, which allows for rear bagging, side discharge, or mulching of the grass clippings. No mower manufacturer produces more models than Snapper. Models are broken down in the categories of Hi-Vac ,Mulching , Pivot-N-Go , and SE Series. TheHi-Vac line has 7 mowers to choose from, ranging in price from $490.00 to $1020.00. Model 21675B is an example of the lower cost machine in this category, featuring a proven side valve 4 cycle Briggs and Stratton engine. Sturdy steel axles and wheels support he stamped steel deck. The blade and deck design live up to the name Hi-Vac, providing unmatched grass lift and bagging performance. Top of the line in the Hi-Vac series is model P21875BVE. This beauty comes equipped with electric start and rear wheel drive self propel, powered by an overhead valve (OHV) Briggs and Stratton 4 cycle engine. The list price is about $860.00. Be sure to check the Snapper website for details on the other five Hi-Vac models. Next is the Mulching series. Don’t let the name fool you - most of the 5 models in this series also sport the ‘3 in 1’ design. Prices range from about $540.00 to $880.00. The lowest price machine in this category is the model RP21675BDV. 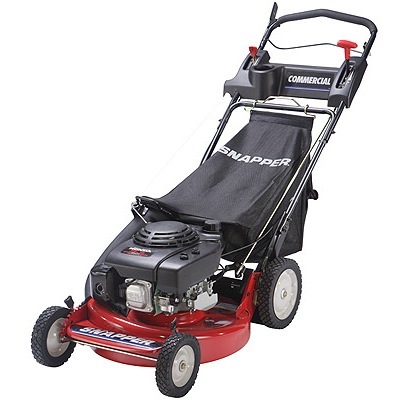 Powered by an overhead valve ( OHV) 4 cycle engine, and featuring a rear wheel drive self propel using the patented disc drive system, this mower is a good value for the price of $540.00. Model CRP2160KWV is on the high end of price and features. Equipped with a Kawasaki overhead valve ( OHV) engine, self propel rear wheel drive with disc drive, and a console with a cup holder, this mower is for those customers that demand the ultimate in features and quality. The engine has a pressurized oil system ( like in a car) with a spin on oil filter! Price is $880.00. The SE Series design has front or rear wheel drive. The ‘3 in 1’ deck design comes standard. This series is for the price conscious consumer, ranging from about $300.00 to $450.00. The highest cost version has an electric start. All 5 models are powered by a standard side valve 4 cycle Briggs and Stratton engine. Pivot-N-Go features a variable speed self propel powered by a side valve Briggs and Stratton engine. The mower adjusts its speed based upon the speed of the operator, up to a maimun of about 4 MPH. The 2 models range in price from $399.00 to $499.00. Most customers that purchase a Snapper mower buy another in the future, based on high satisfaction.